During Friday’s NASCAR Xfinity Series race at Richmond Raceway, Chad Knaus observed the action from a different vantage point. Instead of being a crew chief, Knaus tried his hand at broadcasting. It wasn’t the first time that he had helped to call a race from the booth, and he did a solid job explaining teams’ strategies and what the crew chiefs were probably thinking about at different points in the race. But for Saturday’s Cup Series race, Knaus went back to his day job as William Byron’s crew chief. If you thought the epithet “William Byron’s crew chief” felt jarring for you to read, it was jarring to write, too. For the vast majority of Knaus’ career, his name has been synonymous with Jimmie Johnson and the No. 48 team. The pairing started with the beginning of Johnson’s full-time Cup career in 2002. Since then, Johnson and Knaus went into battle together every race, except for a handful of times over the years when Knaus was serving suspensions. With Johnson in the driver’s seat and Knaus on the pit box, the No 48 team produced seven championships for Hendrick Motorsports. The two were even hailed as the greatest driver-crew chief pairing of their generation. Maybe, the best ever. However, the 2018 season was not up to the No. 48’s usual standard. Johnson never failed to win at least two races per season until last year, when he went winless. He also experienced career lows in top fives and laps led. 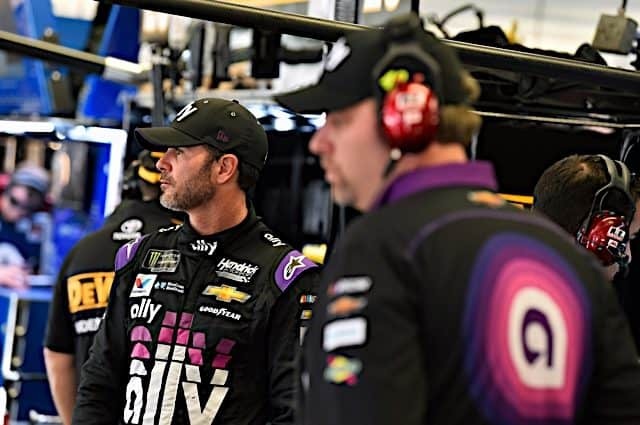 Even when Johnson had a great shot to win at Charlotte Motor Speedway’s ROVAL configuration, he lost control trying to pass Martin Truex Jr. on the last lap. The spin cost Johnson a win and resulted in his elimination from the playoffs. After a disappointing season for his entire organization, team owner Rick Hendrick made the change. Knaus moved to the No. 24 car, with Kevin Meendering stepping up to become Johnson’s new crew chief. Meendering had previously worked as an engineer at HMS before serving as Elliott Sadler’s crew chief at JR Motorsports in the Xfinity Series. The Johnson-Knaus split was shocking at first, given all the other driver-crew chief combinations the duo had outlasted. Not to mention that their success was still fresh in a lot of fans’ minds. After an up and down 2016 season, the No. 48 team caught fire in the postseason like it had so many times before. Johnson won a chaotic final race to secure his seventh title. Interestingly, Johnson earned only 16 top 10s in 2016, a career low for him at the time. It just didn’t seem to matter so much then, because he and Knaus still found a way to capture the big prize. In 2017, the cracks in the No. 48 team became more apparent. Johnson did reel off three wins in the first half of the regular season, but those were his only top fives once the playoffs began. Still, this was the famous No. 48 team and Johnson and Knaus had more than proven their ability to elevate their game when it counted. Yet they did not find their groove in the playoffs this time. Even though Johnson made it to the Round of 8, the once-mighty No. 48 limped to the finish in 2017. Meanwhile, with Johnson struggling the following year, HMS had its eye on the future. While Chase Elliott finally broke through and won multiple races, the team’s other young guns experienced their share of growing pains. Byron won Rookie of the Year but failed to qualify for the playoffs. Not surprisingly, and despite having instant success in NASCAR’s other national divisions, he faced a steep learning curve. Alex Bowman took over the No. 88 car and got as far as the second round of the playoffs. But he was not a week-in, week-out contender for wins either. Given Byron’s quick ascendance to the Cup Series, Hendrick has staked a lot of his organization’s future on the young racer being successful. In Byron’s defense, his rookie year was not bad for a 20-year-old driver racing for a team that clearly had a down year across the board. But seeing HMS’ No. 24 team run mid-pack is almost as weird as Knaus not being on the No. 48 pit box. With the No. 48 team struggling like never before, who better to get Byron up to speed than Knaus himself? Clearly, the new order at Hendrick Motorsports is still a work in progress. Byron did win the pole for the Daytona 500, and he had a good run going for most of the race. However, crash damage relegated him to a 21st place finish. The No. 24 team has had some good qualifying runs lately, earning front row starting spots at Texas Motor Speedway and Bristol Motor Speedway. But through nine races, Byron and Knaus only have one top 10, a sixth at Texas, to show for their efforts. Compared to the first nine races last year, when Byron’s best result was a 10th-place finish, also at Texas, it looks like nothing has changed. Meanwhile, Meendering has not yet returned the spark to the No. 48 team. Johnson did win the Clash at Daytona, although he took some heat for triggering a huge pileup that effectively ended the race. His best run in a full-field race this year is at Texas, where he won the pole, led 60 laps, and finished fifth. He has four top 10s this year, one more than this time a year ago, and already surpassed the number of laps he led in all of last year. But Johnson in 2019 still does not look like the Johnson of old. None of this is to suggest that Hendrick’s latest crew chief swap has failed. If Knaus can get Byron to Victory Lane, it will be a good sign that the No. 24 team is moving in the right direction. Byron leaves Richmond 20th in points but only 15 below the playoff cut line. This season’s battle to reach the playoffs via points looks like it will be considerably tighter than last year. If Knaus can get Byron to the postseason, then his move to the No. 24 team will have paid off in the short term. Even if that does not happen, having three different crew chiefs in three years would be tough for Byron’s development, so expect Knaus to be back at least another season. As for Johnson, his long-term future as a driver is up for debate. Publicly, his commitment to the No. 48 and the rigors of racing in NASCAR have not wavered. He is even running in the Boston Marathon this week. Johnson has proven so many times over the years that he is not to be underestimated. Chances are, he will find a way to return to victory lane. That said, it is reasonable to assume that Johnson’s full-time NASCAR career is in its closing years. No one, not even Johnson, can outrace Father Time forever. I didn’t realize Knaus was responsible for Edwards, Busch and Logano all wrecking in the last 50 laps of the Homestead race. I thought Knaus was responsible for setting up the car that was almost lapped before, ironically, getting a questionable caution which then led to the restart which led to Edwards, Busch and Logano all wrecking. Great revisionist history.